The Amazing Johnny Eck coincides with a second exhibition at MICA that celebrates Baltimore culture. From Friday, Dec. 13, 2013–Sunday, March 16, 2014, the Fox Building’s Meyerhoff Gallery (1303 W. Mount Royal Ave.) will house PICTURE WINDOWS ... The Painted Screens of Baltimore and Beyond, which explores the history and cultural significance of the artistic painted screens throughout the city, beginning 100 years ago. As a young man, Eck was a student of Baltimore’s original screen painter, William Oktavec, and when he returned from his film career in Hollywood, he picked up where he left off, painting screens for his neighbors and far-flung customers and admirers. MICA’s exhibitions are supported by a grant from the Maryland State Arts Council, an agency dedicated to cultivating a vibrant cultural community where the arts thrive. An agency of the Department of Business & Economic Development, the MSAC provides financial support and technical assistance to non profit organizations, units of government, colleges and universities for arts activities. Founded in 1826, Maryland Institute College of Art (MICA) is the oldest continuously degree-granting college of art and design in the nation. The College enrolls nearly 3,500 undergraduate, graduate and continuing studies students from all 50 states and 57 countries in fine arts, design, electronic media, art education, liberal arts, and professional studies degree and non-credit programs. Redefining art and design education, MICA is pioneering interdisciplinary approaches to innovation, research, and community and social engagement. Alumni and programming reach around the globe, even as MICA remains a cultural cornerstone in the Baltimore/Washington region, hosting hundreds of exhibitions and events annually by students, faculty and other established artists. 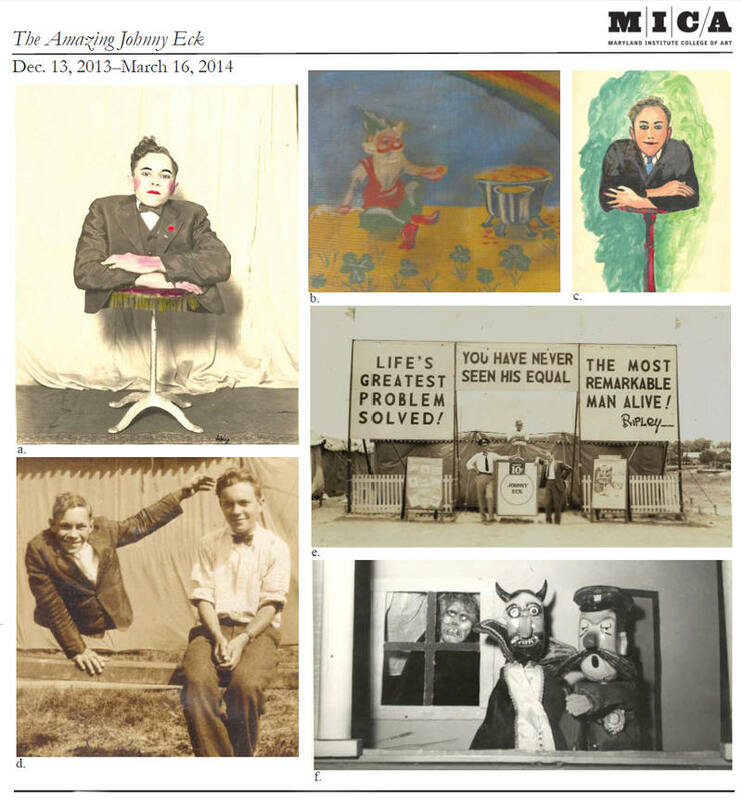 All images courtesy Johnny Eck Museum. a. Johnny on Stool, hand-tinted photo by Johnny Eck, circa 1927.
b. Johnny Eck, Rainbow/Pot O’Gold (detail), painted screen, late 1980s, (Eck’s last ever painted screen). c. Johnny Eck, untitled self-portrait, watercolor, circa 1925.
d. Johnny Eck and his twin brother Rob, Canadian Exposition, 1927.
e. Johnny Eck in front of his bannerline, circa mid-1930s. f. Johnny Eck, Punch and Judy puppets, hand-carved wood and paint, circa 1940.